The acetyl-CoA pathway utilizes carbon dioxide as a carbon source and often times, hydrogen as an electron donor to produce acetyl-CoA. The acetyl-CoA pathway utilizes two major enzymes in the production of acetyl-CoA: carbon monoxide dehydrogenase and acetyl-CoA synthase. Carbon monoxide dehydrogenase functions in the reduction of carbon dioxide to a methyl group. Acetyl-CoA synthase functions in combining carbon monoxide and a methyl group to produce acetyl-CoA. acetogenesis: The anaerobic production of acetic acid or acetate by bacteria. The acetyl coenzyme A (CoA) pathway, commonly referred to as the Wood-Ljungdahl pathway or the reductive acetyl-CoA pathway, is one of the major metabolic pathways utilized by bacteria. This specific pathway is characterized by the use of hydrogen as an electron donor and carbon dioxide as an electron acceptor to produce acetyl-CoA as the final product. Acetyl-CoA is a major component in numerous metabolic processes as it plays a key role in the citric acid cycle. The main function of acetyl-CoA in the citric cycle is to transport carbon atoms. In regards to molecular structure, acetyl-CoA functions as the thioester between conezyme A and acetic acid. Specific types of organisms that utilize this pathway include archaea classified as methanogens and acetate-producing bacteria as well. The following is a brief overview of the acetyl-CoA pathway.. The acetyl-CoA pathway begins with the reduction of a carbon dioxide to carbon monoxide. The other carbon dioxide is reduced to a carbonyl group. The two major enzymes involved in these processes are carbon monoxide dehydrogenase and acetyl CoA synthase complex. The carbon dioxide that is reduced to a carbonyl group, via the carbon monoxide dehydrogenase, is combined with the methyl group to form acetyl-CoA. The acetyl-CoA synthase complex is responsible for this reaction. Carbon monoxide dehydrogenase, the enzyme responsible for the reduction of a carbon dioxide to a carbonyl group, functions in numerous biochemical processes. These processes include metabolism of methanogens, acetogenic and sulfate-reducing bacteria. Specifically, the acetyl-CoA pathway is utilized by bacteria that are classified as methanogens and acetate-producing organisms. The carbon monoxide dehydrogenase allows organisms to use carbon dioxide as a source of carbon and carbon monoxide as a source of energy.The carbon monoxide dehydrogenase can also form a complex with the acetyl-CoA synthase complex which is key in the acetyl-CoA pathway. Acetyl-CoA synthetase is a class of enzymes that is key to the acetyl-CoA pathway. The acetyl-CoA synthetase functions in combining the carbon monoxide and a methyl group to produce acetyl-CoA.. The ability to utilize the acetyl-CoA pathway is advantageous due to the ability to utilize both hydrogen and carbon dioxide to produce acetyl-CoA. Specific types of bacteria which utilize the acetyl-CoA pathway include methanogens and acetate-producing bacteria. Methanogens are types of organisms, classified as archaea, that exhibit the ability to produce methane as a metabolic byproduct. Methanogens, which are found in numerous environments including wetlands, marine sediments, hot springs and hydrothermal vents, are able to use carbon dioxide as a source of carbon for growth. In addition, the carbon dioxide is used as an electron acceptor in the production of methane. 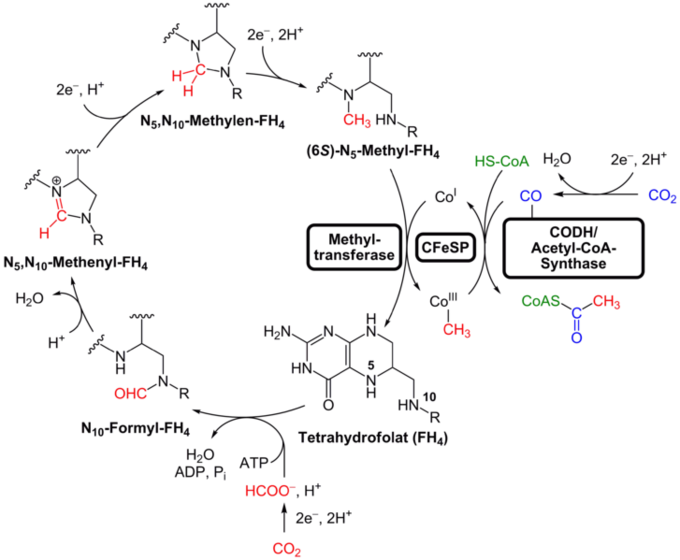 Methanogens are able to utilize the acetyl-CoA pathway to fix carbon dioxide. Acetate producing bacteria, or acetogens, are a class of microorganisms that are able to generate acetate as a product of anaerobic respiration. This process, known as acetogenesis, will occur in organisms that are typically found in anaerobic environments. Acetogens are able to use carbon dioxide as a source of carbon and hydrogen as a source of energy.